Andrea's World Reviews: School Rules - $100 Kohl's Gift Card Giveaway!! School Rules - $100 Kohl's Gift Card Giveaway!! Back to school time is not just about transitioning to new schedules and a new classroom. It's not only about new supplies. Many times it is about a new attitude, a new style and a fresh start. The new school year (or college semester) is about shopping for new outfits and finding ways to express yourself. Everyone wants to make an impression. They want to stand out, but still fit in and feel confidant. Clothing, shoes and accessories are all a huge part of looking and feeling confidant. Finding all the best styles and brands at a good price can be s struggle. Unless you shop at Kohl's, then it is a breeze. Kohl's has everything I look for in a retailer for back to school. They have a huge selection of name brands, an their prices are second to none. I love being able to find supplies, clothing, shoes and accessories all in the same place, from all the brands I want, all with the best price. I love my designer brands. I am a huge fan of Juicy Couture, and I love Kohl's has such a vast selection of their clothing and accessories. Best of all, Kohl's prices are much better than the prices the Juicy Couture sells their own products for at their website and in their stores. So at Kohl's, I cant get double the Juicy Couture excellence for the same price as I would normally spend. 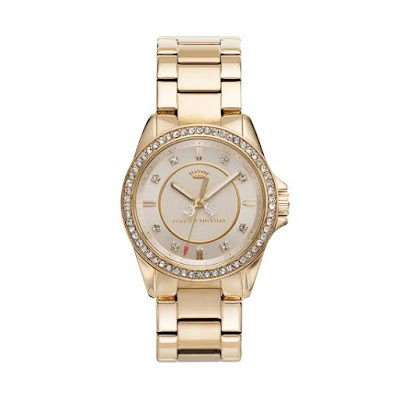 Like this stunning Stella Women's Watch. This watch is amazing. I cannot wait to show it off everywhere I go. The timing is perfect, too. We are going on vacation next week to visit my husband's parents. I have never been out of the state before and plan to see and do everything. I want to look my best on all of our outings, especially since there will probably be lots of pictures. I also love to make a good impression with my in-laws. When most people think of saving money, they don't think of designer watches, but Kohl's has a huge collection of designer watches. Not just Juicy Couture, but Micheal Kors, Jennifer Lopez and many more. I think for older students it is the accessories that make the biggest statement. Everyone has a favorite outfit, but a person can't wear the same outfit every day. A great accessory, though, can be worn every day and add flair and personal style to every outfit. Not to mention that many accessories are also practical. Arrive on time and in style with the perfect watch. Carry yourself with confidence and carry all your essentials with the perfect handbag, shine bright without being blinded with a fabulous pair if sunglasses. Be you and be beautiful with amazing accessories from Kohl's. If you never knew all the amazing brands and products that Kohl's offers, both in store and online, you have truly been missing out. You will never want to shop anywhere else after you see all the amazing things you can pick up at incredible prices from Kohl's. Be warned, it is almost and addiction. Don't just take my word for it. Take a $100 gift card, which one lucky winner will win, and visit Kohl's for yourself. Enter the Rafflecopter below for your chance to win the $100 gift card that Kohl's has been so generous as to provide. Good luck. Be sure to also enter the other giveaways in this School Rules event. There are thousands of dollars in prizes to be won. You can find the other giveaways via the School Rules tab on my site, or by clicking HERE. I do shop at Kohls. Most times, I do not like it. It is very confusing. My son wears a uniform to school. so I don't shop Kohls for school clothes. I do however like Kohls for other things. I shopped for shoes there. Do you already shop at Kohl's for back to school? If so, what do you like most about Kohl's? If not, why? I love the clearance sections of Kohls! I shop at Kohls all the time! I love their selection of women's clothes and I love their sales!!! I love their clothes and houseware department. I can always find a good deal and stack coupon codes on top of that. We do shop at Kohl's, although back-to-school doesn't apply in our house. We mostly get business clothes for my spouse, and I love their kitchen department. I ended up shopping at target for school, but I do like kohls clothing. I've done some shopping. I love doing back to school shopping at Koh's because they have such great deal like the 30% off coupon and Kohl's cash. I don't usually shop at kohl's unless i'm in the area because the nearest store is about 15 miles away. While the closest Kohls is about 30 miles away, I do shop there for back to school to take advantage of their Kohl's Cash promotion (in store and online shopping of course) I LOVE their in store clearance sales where you can combine coupons with clearance prices and Kohls Cash to maximize savings. We shop at Kohls all the time. I like their shoe department the best. We already shop at Kohl's for back to school. I like their frequent sales and their SONOMA jeans for my 7 year old son. Shopping at Kohl's is one of my all time favorite stores!! We went school shopping and got ton's of really nice clothes and shoes for such great deals! Yes! Love their athletic shorts, shoes and t-shirts. I only shop there when I have coupons. Kohl's always has awesome sales and I shop there whenever I can. I like to get jeans and shirts for my son at Kohl's. I like their sales and Kohls cash - good selection of clothes too. I already shop there and i like their sales and rewards program. I love shopping at Kohls. The Kohl's cash and Rewards programs are so great. I always feel like I got a great deal! I only shop at Kohls when they have coupons and sales. Oh we love shopping at Kohls for our back to school! They always have such a nice variety and great sales every time we go! I love shopping at Kohl's for BTS. I can find clothes for the whole family there and they have a great shoe selection. I do shop at Kohl's, but I haven't went back to school shopping there because my daughter isn't in school yet. I shop at kohls all the time and for everything. I find most of what I need for the kids and back to school; they love the clothing. Yes, we definitely shop at Kohls, especially during back to school time! I love Kohl's selection of brands and their prices. I also love that you can use their coupons on regular, sale, and clearance items! I shop at Kohl's all the time. I shop at Kohl's all the time. They have a great selection and I really like that they have coupons and great sales. I always shop at Kohls, back to school and anytime, love the rewards program, it lures me in and then I always buy more than I need! I love their selection of shoes!! I go there several times a year to stock up on shoes! I love the deals they have! I did not shop at Kohl's this year. We shop at Kohl's all the time! We usually find something for our entire family there! They have great deals! We love shopping at Kohls for clothes! Yes, we shop at Kohl's. I like their coupons and sales. I shopped at Kohl's. My son likes their Minecraft shirts and my daughter likes the stylish clothes. Yes, I shop at Kohls! I love all of the rewards and Kohl's cash you can earn! I do shop at Kohl's for clothes for back to school and like that they have good sales and coupons. I don't have any kids in school, but when I did, Kohl's was our main place to shop! I love the clearance sections of Kohl's! Hit them whenever I go there. I love Kohls, the sales are great! Kohl's is the 1st place we hit for back to school shopping! They carry the denim & athletic wear basics that my teen son loves, in addition to the their wide selection of tennis shoes. And the Kohls coupons make it worth the trip!! I already shopped at Kohl's for BTS. I love the discounts I receive from having a Kohl's card as well as the Yes2 rewards and Kohl's cash. What a great savings. I almost always shop at Kohl's. Their clearance is unbelievable and no one beats their 30% off codes and Kohl's Cash! I like Kohls but I don't really shop there to often. Their online deals aren't near as good in store prices though. I shop at Kohl's for myself and my babies. I do shop at Kohls and I like there big selection. I went shopping at Kohl's for clothes. I love their coupons. I love Kohl's because they have such a huge variety and almost everything I could need. I do shop at Kohl's because they have styles I like at reasonable prices. Yes, we have always shopped at Kohls for back to school! We love it because they have great stuff and the all of the prices are great! We do shop at Kohl's. We love the prices and selection. Yes, I do because the prices are reasonable and they have cute stuff. Yes, I already shop a kohls and I love their coupons and sweet deals. I love shopping their clothing department. I love shopping at Kohls. I just wish my kids would stop having growth spurts so I could buy for next year in the clearance sections. Their clearance is awesome. i love shopping at kohls. they have the cutest clothes and a great selection of sales. I like the uniforms they have, very cute! I did shop there for b2s. I like the good prices on shoes and the kohls cash best. We got all our clothes there for a very low price and shoes too. My son and I went shopping there just last night. I love all the great deals they have and the awesome selection for everyone in the family. Kohls is always a must stop when shopping for school, size changes, and seasonal changes, My favorite thing about Kohls is the sales, coupons, rewards program and kohls cash, can't beat all them savings! I always shop at Kohls- they have an amazing selection and prices as well. Yes. I love the shoes...and their prices. I did not. We didn't need anything this year. My kids aren't old enough for school yet but we love shopping at Kohls. I love their prices and the brands they carry, I also love how can you stack savings. I always end up at Kohls for my kids shoes. I love the sales. I do shop at Kohls but not as frequently as I should. I love the shoes and kids clothes. Yes, they always have great discounts. I love the kohls cash. I get great bargains there. I shop at Kohl's - love their sales and coupons. I always tend to find something at Kohl's that I like and they have really great sales! I shop at Kohl's. I really like their selection. I shop at Kohl's since there is one nearby and the prices are decent! I do shop at Kohls, I love the selection of girls clothing for my daughter. I love Kohl's for the variety of brands and the great coupons! I don't have kids in school, but there's a Kohl's very near my house and I like to stop in once in a while. I find that it's kind of hit or miss - sometimes there's nothing, but sometimes there are nice clothes for me at good prices. I like their clearance section....nice cheap prices. They have the best coupons!! I love shopping at Kohl's! Their coupons are great!! Yes, we shop at Kohl's. I love how I can find everything I need for the whole family in one place. Yes, I shop at clothes.I like the sales that they offer that can be combine wtih % and $ off coupons and sometimes they offer kohls cash when you purhase $50 worth of items. We always shop at Kohl's and I love all the sections. Yes, I have already shopped there in the past month. I love that I can stack discounts including 30% off and $10 off a purchase to help maximize savings. I do shop at Kohl's for back to school. I love that they have clothes for eveyone in my family at one store. And, they always have sales or coupons or both so I get a great deal. Yes I shop there for my back to school shopping. I love there products , great prices and quality. I like how they always have sales and discounts! I love the selection of brands and the great clearance deals! Yes, I shop at Kohl's. I love that they have nice sales all the time! Yes, I usually check out Kohls for back to school clothes. They always have really good deals on the brand names my boys prefer. I love Kohl's - great selection and prices! I do, I think they always have great deals and a lot of styles to choose from! I have never shopped at Kohl's but one opened about an hour away. I need to plan a trip to check them out. They have a great selection and sales! My fave place to shop! Yes, Kohl's is always my go to place to shop! I love their selection and their prices are amazing! I shop at kohl's regularly, I love their selection and sales. Yes we shop at Kohl's for back to school for the grand kids. We love their sales and great customer service. I have shopped at Kohl's in the past, and I thought that they had wonderful prices on lots of things that I wanted. The closest Kohl's store is about an hours drive from my house, so I only shop there when I'm in the city. I did shop at Kohls for my daughter this year ...her friend had gotten some good deals and told her about them so we went and found some great sale items too! I do buy back to school things at Kohl's already. They have a lot of variety and good sales. We are doing our back to school shopping Tuesday and we will be going to Kohl's ampng other tores. Yes I was just at Kohl's the other week shopping for tops. I love Kohl's. Yes, we bought backpacks there this year. I love the variety there. We shop at Kohl's for their great deals! I love shopping at kohl's!!! I like that Kohls is a one stop shop. For gifts, household things, jewelry, make up, kitchen, some outdoor and dorm things, LOTS of clothing, and even a place to pick up greeting cards and wrapping paper. What's left to want?!!! I like that I can get great deals on nice clothing, shoes, and home goods! Typically, I don't shop at Kohls, I've had some bad experiences with them. They've done me wrong a few times. However, there are pants that my mother really likes that are sold there, so I'd probably get those for her with the gift card. I love Kohls! I love the deals and the styles are perfect! It is my favorite store! Yes we shop at Kohls! What we like best are the SALES!!! The styles are current, and the store is always so nice and friendly. I have not shopped there for years. I would love to go back, though, and check out their clearance racks for great deals. School Rules - 3D Light FX Review & Giveaway! School Rules - Fresh n' Lean Review & Giveaway! School Rules - My SpaLife Review & Giveaway!